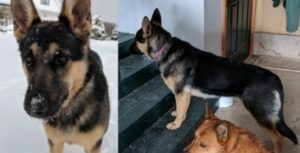 Additional Notes: Typical German Shepherd markings. Pink/purple collar. Timid around new people. She just disappeared Thursday morning. She’s never ran off the property before. She never goes anywhere without our other dog who is still here at home. I saw a dog that fit the description of this one with similar colored colar, walking along the sides on Bridge Street close to the Canadian Tire/Sobeys. I was not sure if the dog was alone or with an owner being walked off leash. I couldn’t stop on the road due to traffic. I back tracked when it was safe but I couldn’t find dog after. This was on Thursday.